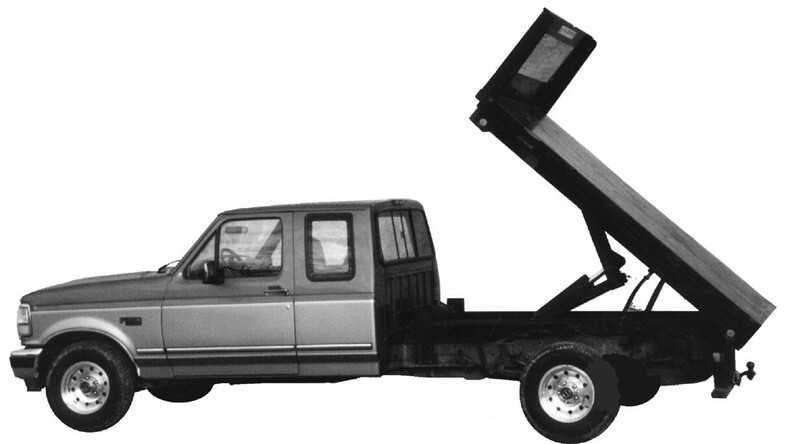 These truck beds are dumping flat beds with built in sub frames, Scissor hoist lift and electric hydraulic pump. Installation simple, bolt the sub frame to the truck frame and connect one wire to the truck battery and mount the electrical controls in the cab. Our body measurements are total width which includes rub rails. Lengths vary from These truck beds are dumping flat beds with built in sub frames, Scissor hoist lift and electric hydraulic pump. Installation simple, bolt the sub frame to the truck frame and connect one wire to the truck battery and mount the electrical controls in the cab. Note: 9' & 10' will be supplied with L300RD hoist system at 5 Ton Capacity! 9' x 85" Dumping Truck Bed Rail Width 34" or 38"
* Mud Flaps - See our mud flaps section Note: when sizing your bed, it needs to be 6" longer then your frame or it will be necessary to cut the frame. Each bed will be partially wired and lights will be installed. Many options and parts are available! Please contact us with your specific need so we can get you exactly what you need!